When is it okay to act like a snob? Is it okay to hate on someone who hasn’t waxed their eyebrows in two months (or ever)? No. Is it okay to seat yourself at a restaurant because you have the patience of a 5-year-old and can’t wait 13 seconds for the host to direct you to a table? No. And, is it okay to say that something is perplexing instead of confusing. Hell no. There’s only one instance when it’s okay to act like a snob, and that’s when it comes to food. I’m not talking about judging people who hit up Taco Bell and BK in the same trip, or the all-stars who eat squeeze cheese right out of the can. I’m talking about refusing to buy produce that tastes like the plastic fruit your mom used to keep on the dining room table. For some food snobs this may be buying dark greens over iceburg lettuce or portobello mushrooms over white button, but for me it’s all about tomatoes. My name is Lauren and this is my story. I am a tomato snob, and I am proud to say it runs in the family. When my dad was a kid growing up in Illinois, his uncles had a huge tomato farm right down the block from his house. He’d find himself posted up in his Radio Flyer wagon, salt shaker in hand, enjoying the fruits of their labor. In the 70s, when him and my mom were in college, they created their own tomato heaven on a farm outside of Ladysmith, WI, where they’d harvest at least 100 tomato plants each year. They didn’t really have a choice as all their college buddies relied on them to provide the tomato juice for bottomless bloodies on football Sunday. Hello, Wisconsin! Even after they moved off the farm and started a family, they kept the tradition alive. Growing up, summers in my household meant digging holes in the soil and endlessly filling up watering cans from the hose. But all that hard work paid off in the fall when you’d pick a tomato straight from the vine and bite into its warm, juicy, tomato-y deliciousness. You automatically thought, now this is what a tomato should taste like. Until I moved to college and started buying my own food, I didn’t realize that tomatoes from my dad’s garden tasted different than tomatoes from Aisle 12. I remembered the word “heirloom” spewing out of my dad’s mouth when he’d draw up blue prints for his garden each year, so whenever I saw those at the store, I’d ditch the 99 cent Romas and splurge on the heirlooms. Other than that, I didn’t really know why I was a tomato snob, I just knew that I was one. Seven years later, I finally decided to pick my dad’s brain to see why I am so prejudice against Roma tomatoes. Side note: If you buy Roma tomatoes, we can’t be friends. It’s like trying to pass off the $16 boyfriend watch you bought at Target as Marc Jacobs. Stop it. So, the reason my dad’s tomatoes taste so good is because they are of the “heirloom” variety (or “old world” as my dad says). This means that they have never been crossbred, which results in a bolder, more natural flavor. Contrarily, the reason that most of the tomatoes at the grocery store taste so bad is because they are of the “hybrid” variety. This means that they have been crossbred to have specific characteristics, such as resistance to pests and disease and a perfect uniform shape. 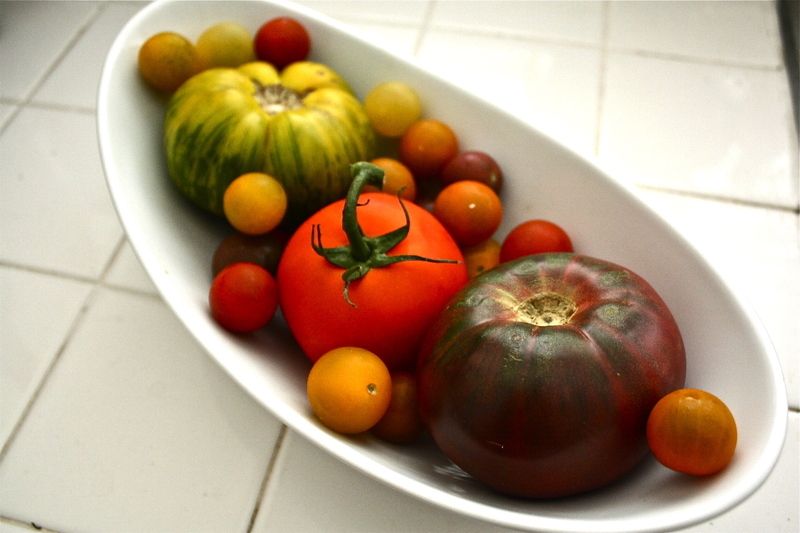 Although hybrids may look pretty, they lack the flavor that heirloom tomatoes provide. On the other hand, heirlooms may be misshapen and more susceptible to disease, but they produce a richer flavor. I asked my dad to share some of his favorite breeds and their characteristics from his own garden, and this is what he came up with. Brandywine – BIG. Yellow and red in color. Juicy. Pineapple – BIG. Orange and yellow stripes. Juicy. Prudence purple – Purple, green, and red in color. Old German – Orange/red in color. Green zebra – Green stripes. Black Russian cherry – Green and purple in color. Sweet. Larger than average cherry tomato. Tomatoes can be tossed in anything from salads to sauces, but here are a few of my family’s favorite ways to enjoy freshly picked tomatoes. 1. Plain Jane—Cut tomato into thick slices and sprinkle with salt and pepper. 2. Old school sandy—Spread butter on a piece of white bread. Layer with thick slices of tomato, sprinkle with salt. Top off sandwich with another piece of white bread. 3. Caprese crostini—Layer sliced tomatoes, fresh mozzarella, and basil on a large platter. Drizzle with olive oil and balsamic vinegar. Sprinkle with salt and pepper. Lightly toast crostini and rub with raw garlic clove. Assemble tomato, basil, and mozzarella on top of crostini. Tomatoe snobs unite! Can’t wait for my herloom patch of tomatoes to start ripening this summer. Great blog Lauren. By the way that Norm guy seems kinda cool! !